Providing you the best range of cricket baggy cap, baggy cap and baggy cricket cap mahroon with effective & timely delivery. 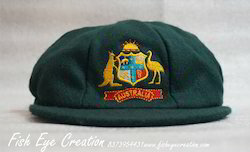 This is cricket baggy cap. It is made with woollen fabric. it can make in different colors like navy blue, maroon, bottle green and black. We are highly specialized firm instrumental in manufacturing and supplying wide endowment of Baggy Cap. Our offered caps being precisely designed and smooth in finishing, are widely accepted in the market. We utilize best quality fabric and advanced machines for their stitching as per latest industrial standards. Apart from this, we supply these caps in defect proof packaging at reasonable price tags. With the support of meticulous professionals, we are engaged in manufacturing and supplying best quality Baggy Cricket Cap Mahroon. Extensively popular among cricket players and fans for their unique design and sweat absorbing traits, these caps are designed by skilled designers as per latest fashion vogue. 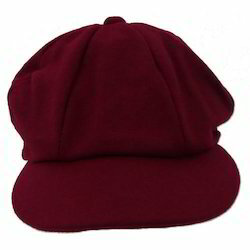 Furthermore, these caps are widely demanded in the market due to their availability in various sizes and colors. Looking for Baggy Cricket Cap ?